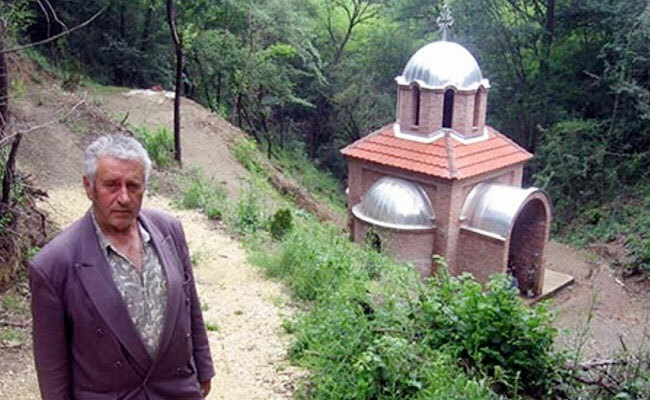 Pensioner Tomislav Miladinovic from Mišljenovac near Kučevo, built a church dedicated to St. Petka in the woods Lešje, Serbian daily Telegraf reported. Twenty residents helped with contributions, but most of the money provided Tomislav. He also paved the way to the church through the woods, a distance of about 200 meters. Tomislav Miladinovic, who spent three decades working in Hanover in Germany as a crane operator, said that he decided to build an Orthodox Church in the woods after a strange dream his daughter Ljilja had. She told him that Saint Petka appeared in her dream and showed her where the spring is. After digging on the site, under the willows, spring water appeared and on that same spot they decided to build a church. “Older people say that at this same place there was a monastery once, and I personally saw wood paneling and walls when we were digging the foundation,” said Tomislav. Near the church in the woods Lesje there are three springs with water that natives believe to help in the treatment of eye diseases, arthritis and high blood pressure.